It was an Easter Sunday on 26 March 1967. At around 3pm that day Jim Thompson, already well known as the "Thai Silk King", walked out of Moonlight Cottage where he was holidaying with friends in Malaysia's Cameron Highlands and was never seen again. It was not simply Thompson's fame and wealth that guaranteed his disappearance would become one of South East Asia's greatest modern mysteries - it was his past. He had spent World War II with the OSS, the US intelligence agency that was the precursor to the CIA. 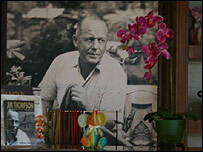 After the war he settled in Bangkok and in 1948 started the Thai Silk Company. In doing so Thompson played a pivotal role in reviving the Thai silk industry. He introduced modern dyes, better looms and oversaw production and marketing while allowing his weavers, most of them women, to work from home and share in the company's profits. It made Thompson a millionaire. But it was also rumoured that Thompson maintained his links with American intelligence. So when he vanished it was front page news and the theories about his disappearance started to multiply. "I got a call from a friend that an American millionaire was missing, jungle walking," remembers Chou Chuan Sheng, who at the time managed a local hotel and acted as a Cameron Highlands stringer for much of the Malaysian press. "I got all the story from Jim Thompson's close friend, Mr TG Ling, Mrs Ling and Mr Thompson's friend Mrs Mangskau." 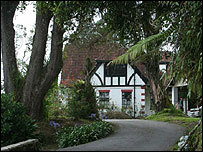 The Lings owned Moonlight cottage and Mrs Mangskau had travelled to the Highlands as Thompson's companion. For the first couple of days Mr Chou had unimpeded access to the group. "Thompson went for a walk that Sunday alone without telling anybody. Dr Ling, from his room adjacent to the hall, could hear footsteps and he took it that it was Thompson's footsteps and that he went out for a walk." He was expected to return for tea but when he failed to appear Dr Ling went to the police station at the nearby town of Tanah Rata that evening and reported Thompson missing. But then the security net closed around Thompson's friends, and reporters were prevented from speaking to them. Meanwhile, the search was stepped up with British troops and two Royal Army Air Corps helicopters joining their Malaysian colleagues. Brigadier General Edwin Black, a long-standing friend of Thompson's and commander of US support forces in Thailand flew in to assist, as did some of his senior colleagues. This was the 1960s in South East Asia. Vietnam was 10 months away from the Tet Offensive and while the Communist Party of Malaya had been driven north over the Thai border its reach still extended to the Cameron Highlands. Despite there being a manhunt on an unprecedented scale, with 400 or more people involved in the search, no trace of Thompson was found. The official explanation was that Thompson had probably become lost in the jungle or had fallen down a ravine while out walking. 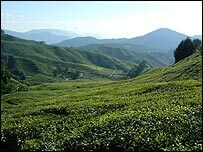 Tristan Russell, whose family has run tea plantations in the Cameron Highlands since the 1930s, does not believe it. "He apparently only went for a short walk. There's no deep jungle there so how one could be lost in the jungle and not be found I can't see. I've never accepted the theory that he could have been lost in the jungle." As the days and weeks passed the search began to attract rather more unorthodox helpers, including Malay bomoh (traditional magicians) and Chinese mystics. "In Malaysia we have these temple medium people and they claimed they could tell where Thompson was," Mr Chou recalls. "Because of the reward for Thompson alive or dead, four or five of these temple mediums formed themselves into a band with cymbals, drums and so on and went into the jungle. But they didn't reappear so the police had to send people to rescue them." 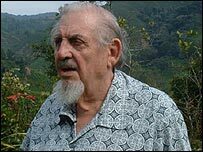 Then there was Peter Hurkos, a renowned TV "psychic" and entertainer, who was accompanied to Malaysia by Lt Denis Horgan, a member of Brig Gen Black's staff. His explanation fell into the group of theories that stemmed from the belief that Thompson was working for the CIA. "He has been abducted to another country but is not being held for ransom," Hurkos told Mr Chou at the time. "I stake my neck on this." Hurkos claimed he "saw" 14 men in dark green uniforms; Communists, abducting Thompson and bundling him into an army truck. Others claimed that he had staged his own disappearance possibly because he feared being exposed as either gay or as a double agent. Phil Rivers, a former officer in the Malayan police and a long-time resident of the Cameron Highlands, says the conspiracy theories became more and more outlandish. "They had convoys of Thai cars racing up and down the hills, they had mysterious strangers showing up saying they'd been told he was hidden nearby in a bungalow, or in a cave or he was on top of a mountain somewhere." There were further theories that Thompson had been taken by a tiger. Some believed he had fallen into an animal pit dug by the indigenous people of the area, known generically as orang asli. Mr Rivers thinks his end may have been rather more mundane. "The most common rumour up here is that he was abducted, but I've come across a couple of other stories. "One of them is that he was knocked down by a timber lorry and that his body was taken away and run through a buzz saw and another one is that he was knocked down by another chap who was doing some work locally and was buried." Mr Rivers says he is investigating reports that a local man made a deathbed confession to this effect. Forty years on and the mystery of Thompson's disappearance seems no closer to being solved than it ever was. However the Thai Silk King's name lives on - used by silk shops and restaurants and in the annals of modern Asian mystery.